So for the last couple of hair removal times I have retried waxing. I say retried because I have tried waxing body parts in the past but have had real mixed results. I figured that I would try it another time and so I have tried my chest, which hurts like hell btw. I also have done my legs, which often end up getting bruise like marks on my thighs, and I have done my arms. The arms worked well the last time I tried but this time I don't think that the hair was long enough. The thing that I don't like about waxing is that I am looking for perfect results. And what I mean by perfect is that if I wax a body part I expect that there would be absolutely no hair left on that part. But that is not the result that I get. I normally get most of the hair, but not all of it. I'm going to experiment with it and try to wax repeatedly to see if I can get better results. I will let you all know how it goes. 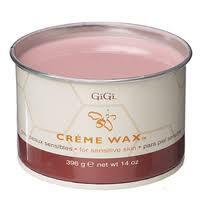 Photo - This photo is of the waxing product that I actually use, and I personally highly recommend it. I have tried many different brands, be the Gi-Gi waxing system and products work great! Although I no longer use the creme wax, I have found that the dark honey type works better for my hair type.